Truth be told, it takes a lot to get me excited about eating out. I have been very fortunate to have eaten in some amazing places. But eating out hasn’t always been a stellar experience. Most restaurants have been fairly run-of-the-mill. Sadly, some have been like trying to endure what I call gastronomical purgatory. Those meals, I try very, very hard to forget. Once in a while, a select few fall into a special category. Tsumura is easily a member of this group that can only be labelled as simply food nirvana. Before I move on, let me address the issue of price. I’ve heard the puns. Tsumura is anything but mura or cheap. In fact, it should be called Tsumahal. I won’t deny it. The prices are on the higher end of the scale. But it’s not as exorbitant as one would imagine. In fact, if you avoid the overtly premium items like the imported toro sushi at P400/piece or the P16,000 bottle of sake, your bill will be comparable to having eaten in any fine dining restaurant in Manila. As my friend, Sharkey would have called it, Tsumura is simply a ‘value for money’ dining experience. The pristine quality of the ingredients, the craftsmanship that goes into the preparation and plating of the dishes and higher standards of service can easily justify the prices. If Japan had a signature dish, it would be sashmi. Nothing captures the gastronomical essence and culinary vibe of Japanese cuisine better than a beautiful crafted platter of immaculately sliced, fresh seafood. In my mind, any Japanese establishment can be judged solely by how they serve this dish of subtle refinement. Needless to say, A and I decide that sashmi would be the best way to begin our dinner. Tsumura did not disappoint. A pristine dish arrives at our table. On this circular platter is a vast array of seafood resting on a bed of glass noodles: slices of toro, salmon, yellow fin and mackerel, slivers of cuttlefish and octopus and little mound of sea urchin. It’s almost too lovely to eat. But overcome with hunger, we tuck in and gingerly taking the dish apart piece by flavorful piece. Every bite is a taste of the sea. Clean. Uncomplicated. Every piece of sashmi reveals the understated textures and flavors specific to each piece. Every slice almost seems to melt in your mouth. Simply food nirvana. I’ll never be able to eat sashimi anywhere else again, without comparing it to the sublime and elegant experience that is Tsumura. so how much was the sashimi selection platter? i am just curious. I recall my first dinner at Tsumura, we were all very happy with our dinner, except this rather uncivilized guest who kept complaining about her chicken teriyaki (of all the lowbrow things to order at a nice Japanese restaurant and she orders chicken teriyaki). I'm so glad I've had return visits there without those kind of annoying people. Hi Anon. The sashmi platter for two was P1750. Hi Joey. Not an everyday Japanese restaurant. But it's worth every peso. Hi Wysgal. Wish I could take credit for the 'TsuMahal' pun. I think one of the bloggers came up with it. Hi GUS. I would say about P1500 per person should be more than enough. Unless you are a glutton of Japanese cuisine, then bring a credit card. Because, sky is the limit at Tsumura. thanks for the info..P1,500/pax is indeed mahal :D, but rather manageable naman, given the right occasion and dining partner. That sashimi platter really does look so fresh and of good quality. I'll never be able to eat sashimi anywhere else again, without comparing it to the sublime and elegant experience that is Tsumura." I can relate... A Japanese resto nearby used to be my go-to place for sushi, but I must say that after trying Tsumura, that place pales in comparison. Actually, for the quality of their raw seafood, the price of their 9-pc. Assorted Sushi is super reasonable. Nice blog you have here. My wife and I love looking for new places to eat off the beaten track. I've never tried Tsumura, but with good reason. When in Makati, we head straight for HATSU HANA TEI (2nd floor Herald Suites along Chino Roces Ave). It's probably the best price/quality combination Japanese restaurant I've found in Metro Manila (it used to be Sushi Kappo Kasei, until it closed down). They have practically everything, but the sashimi sets are excellent. Try any of their sumiso (seafood salad with a miso-wasabi-based dressing). For dinner my wife and I treat ourselves by splitting the biggest Kaiseki (which includes the sumiso dish). Excellent Japanese food for not so much money. We've tried NIHON BASHI TEI (not the steak) and IMHO, it's just not worth comparing to HATSU HANA. For Okonomiyaki, I've found the best ones are at Kagura inside LITTLE TOKYO. It's nice to eat at the bar so you can watch the owner cook your order. And for ramen, our absolute favorite is this small restaurant along M.H. Del Pilar Street in Malate called KYOFUU. Best miso and shoyu ramen I've ever had (even comparing to Shinjuku). Their gyoza is also quite different, with more garlic than usual. The head waitress tells us the restaurant's been around since 1982. 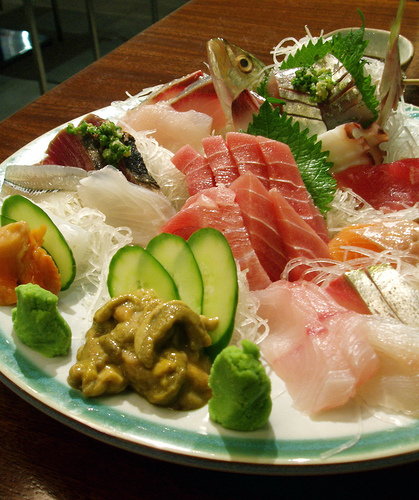 Oops, I realized later you also have an entry about HATSU HANA... have you tried their sashimi for two? It's half the price of TSUMURA's, but about the same size based on your picture here.